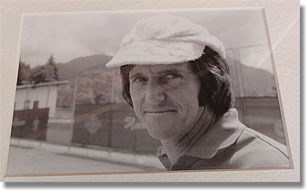 A picture of Emmo when he first arrived in Gstaad ... hanging in the tennis shed at the Palace. Emmo was right the first time. We woke to rain. And it was, in fact, no problem. A brisk walk in a light drizzle to the Palace, a seven-minute drive to a downtown sports center with three hard, rubberized courts, and we were good to go, especially if you like hard, rubberized courts. Me, not so much, but seven hours later—a solid five of which were devoted to hitting balls, we’d had more than our fill of tennis. 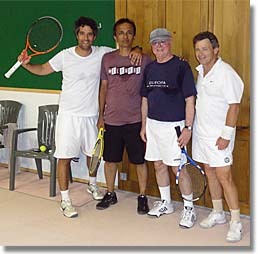 At Newcombe’s Ranch, last October, I’d played intensely every day for the Dunnies team, singles and doubles, and I doubt I ever hit as many balls as I did this first day at the Tennis Week. More than likely, the three consecutive days of leisure contributed to the exhaustion. The weekend had included a brief shopping trip, where I found a package of tennis socks—three pairs—for 36 francs. That’s about $37, if you’re scoring at home. They did say “Head” on them, but still … and they were shorties! Nothing in this valley is cheap, but nothing seems cheap either. Gstaad gives as good as it gets. Fabienne and her commuter car: note the raindrops ... the Alfa likes it dry. 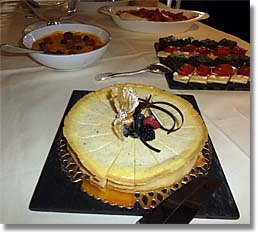 Monday lunch desserts, before the Swiss ski team has gotten to them. Lunch itself was a buffet, in a side dining room that permitted us to flout the house dress code and stay in tennis clothes. That was the good news. The bad new was that we shared the buffet table with the Swiss National Men’s Ski Team, which apparently is doing its summer training here this week. “The staff can’t replenish it fast enough,” said Fabienne sternly. I could see the Eloise rising. Morning had begun with a short tutorial by Emmo on the art of the forehand. His approach, to put it simply, is to keep everything simple, and stay balanced. He cited Ken Rosewall at the day’s start, and again at day’s end. Compact stroke, feet set, move the racquet through the ball. Then he and his five staff pros, led by son Antony, took us through extended warm-ups and hitting drills. 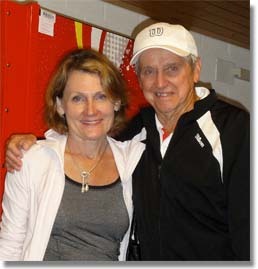 For most of the time, we were set up as doubles teams, playing points, focusing on either returns or our net games. Instruction was in a personal, one-on-one, being-taken-aside-for-some coaching way. It felt casual and comfortable. I got even more comfortable in the afternoon, when the skies cleared for a couple of hours, and we got on the red clay. The courts front the Palace—four in a row—and serving towards the south end, you’re distracted—seriously distracted—by the backdrop of the Alps, green in the valley, brown and white in the distance. The doubles I was playing in grew a bit more serious, particularly when Mohammed, who commutes from Gstaad to Dubai, where he has financial services and commodities trading businesses, joined the game. Mohammed had sat out the morning, the first casualty of the day. He had explained that he’d pulled or tweaked something in his neck while he was stretching at home, and would now probably need treatment … steam, heating pads, massage, jacuzzi, more stretching, medicine. I assumed he’d be at the spa all week, if not the infirmary.. But after a miraculous recovery—I couldn’t decide whether to call him Neck Boy or Massage Man for the next few days—he was hitting world-class serves and an occasional out-of-this-world forehand (many of them, on the other hand, seemed designed to travel to another planet). As the day wound down and the rain drove us back indoors for the final hour, Mohammed—whether the meds had kicked in or he just got loose was unclear—became unbeatable. Aided by his partner Schree (that’s a phonetic spelling; if he too hadn’t hit unreturnable serves I would have gotten him to give me the correct one … just kidding … sort of; the correct spelling, I later found out, is Sri), Mohammed won a very good 7-5 victory over my partner Steven and me. But I knew we had four more days to get it back. What Lesley had got on Day One, she would say later, was a tremendous boost of confidence. 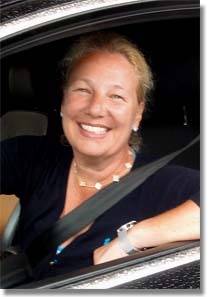 In the early afternoon, on the red clay, Emmo had spent nearly a half hour hitting with her one-on-one … carefully going through her forehand, backhand, volley, and overhead. “You’re a better player than I first thought,” he had said, while she beamed. He’d made slight adjustments to her stance on both sides, and to how far back she should take her racquet in preparation. Simple stuff, like Rosewall. She couldn’t stop talking about it. Ah, Terry and Leslie, this class of athletic travel suits you well. Looks like you are getting what you went for, and I am enjoying your posts, though I got behind due to our travel out here. Here in Salina, Kansas, hair drier windy and 104 degrees F, things are going well, too. It’s a great place to sweat. Or grow wheat. Classic midwestern town, mansions along main street a little tired, population aging. Farming is no longer a way to get rich. Carolie’s dad, 86, and a former farmer, who made his fortune as an electrician when farmers started putting power into their barns after WWII, got a hip replaced yesterday (surgeon semed too young to drive), and is fine, though not dancing yet. Yep! A long way from Gstaad, but all’s well. Thanks for the adventure! Loved the cow traffic jam! Tennis Resort Court Fees: What’s Fair?